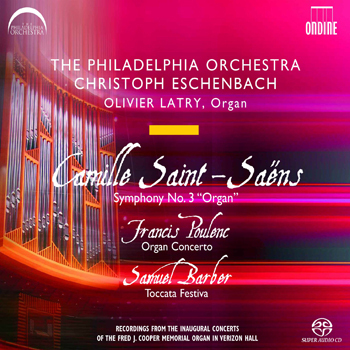 In a strong field of over 30 available recordings (of Saint-Saëns's 'Organ' Symphony), the performance that succeeds best is the Philadelphia Orchestra's under Christoph Eschenbach. (...) it is a breathtaking achievement. (...) a Saint-Saëns Organ Symphony that blazes its way right to the top of the pile. Ondine provides a recording of weight and immediacy, capturing the distinctly expressive sound of the massed Philadelphia strings - substantive, meaty, a living tissue - across a soundstage that is wide and coherent, and that puts organ and orchestra in the same space. I have never heard an organ sound so good from top to bottom in a thoroughly natural concert hall setting. The inauguration of Verizon Hall's new organ has been preserved for all of us in one of the most outstanding SACDs yet. Somehow, producer Martha de Francisco and her team (assisted by Polyhymnia) have captured the detail, sweetness, and power of the orchestra, as well as the organ’s pipes and pedals, in a recording that is more than a sound spectacular. The playing is jaw-droppingly beautiful (those Philadelphia strings! ), and the organ so well-integrated into the sound (...) The recording itself is a stunner (...) demonstration-quality result. (...) The balance is utterly realistic, and the bass is staggeringly good if your system can reproduce it; os is the surround sound from the SACD layer. (...) As a record of a great occasion it's a winner. Another winner of a SACD from the new collaboration of The Philadelphia Orchestra and the enterprising Finnish classical label Ondine. (...) This new recording (of Poulenc's Organ Concerto) stands out as the best yet in my opinion. A highly recommended hi-res surround release, and packed with nearly the limit of music one disc can hold, plus provided in a slipcase with a larger note booklet. The orchestra is in glorious form, with rich strings and a ringing brass section (...). The Barber and Saint-Saëns are played in a celebratory mood, with organist, orchestra, and conductor syncing up perfectly. (...) these performances capture the instrument's power and range of colour guided by the masterly Olivier Latry. (...) Eschenbach delivers a performance that is (...) exciting and scintillating. This salute to a new organ finds the Philadelphia in mouth-watering form. (...) Eschenbach's intuitive readi ng [of Saint-Saëns's “Organ” Symphony] c asts the work in a rich perspective (...). The organ shows its stature with palpable depth in the first movement and majestic presence in the finale; but the real star of the show here is the Philadelphia Orchestra itself. (...) the string entry just before the close of the first section is, as they say, to die for. Just on the basis of the Saint-Saëns symphony, this disc is among the best out there. It boasts a French suaveness showing the Philadelphia strings at their best, but also an edgy grandeur, especially in the way that the final movement is played like a matter of life and death. (...) The sound quality is the best Ondine release yet, well-focused but spacious, allowing the microphone-friendly organ and orchestra to blend beautifully. Saint-Saëns's Third Symphony [is] conducted with such majestic fury by Christoph Eschenbach it takes your breath away. (...) The sound is magnificent and thrillingly loud. Especially on SACD surround system the sound appears to be phenomenal and strikingly spacious. A sonic spectacular with the 'King of Instruments'... - For their fourth recording together, Music Director Christoph Eschenbach leads The Philadelphia Orchestra through a program of prominent masterpieces for organ and orchestra, joined by world-renowned organist Olivier Latry of Notre-Dame Cathedral in Paris: the majestic "Organ" Symphony by Saint-Saëns, the spiritually imbued Organ Concerto by Poulenc and the very celebratory Toccata Festiva by Barber. Recorded at the inaugural concerts of the Fred J. Cooper Memorial Organ, the largest concert organ in the United States, this CD captures The Philadelphia Orchestra and its new organ in all their sonic glory. The press qualified the performances as electrifying ("one of the great performances in Eschenbach's music-director tenure. (…) If this performance is well-captured on disc, it will be a case of lightning in a bottle." - The Philadelphia Inquirer, May 13, 2006).